Fiurst, we would like to thank Dreamie for permission on having this guide @ ITCoW.com, this guide will show you and explain what overclocking is, types of overclocking and how to cool it. Here it is! Enjoy! Overclocking is where you force your rig to run at a higher speed than its advertised speed. The higher the speed, the more heat it produces and the less stable it will get if without sufficient cooling. Overclocking can be for the whole system, or just specifically for the CPU. Factors affecting the ability to overclock include stepping, week/year of production, manufacturing process and many more. Motherboards which provide overclocking settings in the BIOS or through jumpers/DIP switches on the mobo itself are required to overclock your CPU. Voltage increases stability, as well as heat produced. Anything above 60C for me is HOT, anything under 50C is the safezone. Most mobos nowadays have thermal protection circuit, safely cuting off the power supply when the CPU have reached a certain threshold. On AMD’s Athlon/Duron line of CPUs, the multiplier can be unlocked, either through closing the L1 bridges or the last L3 bridge. Some come factory unlocked. All Intel CPUs which comes out of their factory after August 1998 have their multipliers LOCKED, unless you are using a INTEL CONFIDENTIAL CPU, which is actually the prototype chip they use for testing purposes. RAMs also affect overclockability as when FSB increase, the speed at which the RAMs operate at also increases. Take for example the ratio is 4:5 [4 = CPU fsb n 5 = RAM speed]. By default the CPU should be running at 133MHz, so take (133/4)*5=~166MHz, which is the speed of the RAM. Most motherboards provide the option to change the ratio> Increasing RAM voltages also increases heat output n stability. The Northbridge normally have a fan. As the FSB is controlled by the Northbridge, it is also vital that the northbridge you use is good. The name “Northbridge” comes from the fact that it is at the NORTH of the mobo. There is also a Southbridge which controls other things. For the new nForce2 chipset [or platform processor], there is a VDD mod which can be done. I only know how to do the VDD mod on the Asus A7N8X and the EPoX 8RDA. It is simple but can easily void warranty. nForce2 is the only chipset i have seen so far that really benefits from watercooling as it is a very very hot chipset. Temperatures of it can rise to be higher than that of a OVERCLOCKED CPU!! Changing the speed of the FSB will also mean that the speed at which the whole system runs at changes. If your mobo have the ability to LOCK this speed, then you do not have to worry about this. Increasing the speed of this will mean that the graphics card will work @ a higher speed [AGP], the sound cards, network cards..etc [PCI] will also work at a higher speed. The HDDs will also work faster, and this may lead to data corruption. GPU/VPU overclocking overclocks specifically ONLY your graphics card. For most *dated* graphics card, overclocking the memory of it increases performance more than o/cing the core. Most *modern* graphics card will benefit from overclocking the GPU/VPU. O/cing the GPU/VPU will increase game performance as it will grind those numbers faster. There are many ways to cool a hot semiconductor. Here are some of the more common ones. Above, the Thermalright SLK 900 air cooling system. 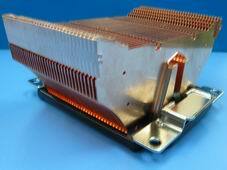 Most, if not all, semiconductors nowadays that produce a considerable amount of heat requires a heatsink. 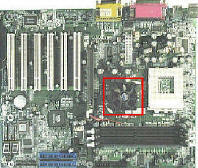 Fan is required if the semiconductor is REALLY hot, like your CPU and GPU/VPU. A heatsink is a block of metal which is cut in such a way that it increases the surface area in which heat will be cooled. Silver is the best conductor of heat, followed by Copper, Gold and Aluminium. The alloy of Silver and Copper is a even better conductor of heat than silver.The fan which is fix above the heatsink is to push/pull air pressure at the heatsink so that heat is conducted to the air and then pushed out to the surrounding air. Air-cooling is a simple and efficient way to cool down without much worries. It isnt, however, a good choice for extreme overclockers. Watercooling is as the name implies, cooling through water as the medium. Since water is a better conductor of heat than air, it is used by semi-extremists to overclocking. Some people gone the dark side of watercooling just for silentness. I’m not going to elaborate too much here, but you can ask for answers to your queries at the Watercooling Forums here (http://forums.natriumtech.com/viewforum.php?f=4). I’m sure the friendly members there will help you out. 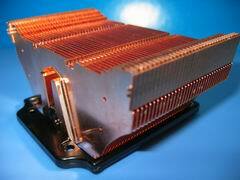 Thermoelectric cooling is the act of cooling through the use of electrical energy. The peltier effect, which was discovered early last century, is that when DC current passes two metal alloys, a heat differential will form, causing one side of it to be cold and the other to be hot. This temperature differential can be so great that the cold side can reach sub zero. Therefore, this is a good way to cool down a hot semiconductor, but if you cant cool down the hot side efficiently enough, the heat will go back to the cold side. Phase change cooling is a extremists level to cooling.There are currently 2 prominent players in this arena of extreme cooling, Vapochill and Prometeia. This kind of cooling requires a compressor, condenser, evaporator and is connected with insulated pipes. The cooling medium are freon. The more common ones used are R134a. Temperatures can reach -50C and lower. I will strongly recommend you visit the following site to download some important applications which overclockers require. Although not a must, still sweet to have them. The site is not in English, but you should be able to make out what it is. This guide will be constantly updated. Please check dreamie’s guide to overclocking.